Ideally located, ski in ski out, overlooking the village, all comfort and luxury, neat decoration. - immediate access to the largest ski area in Europe (Méribel, Val Thorens, Les Menuires, Courchevel). - apartment classified 4 stars (5 flakes) in March 2018. - in summer, hundreds of kms of hike paths; the superb golf of Méribel. Luxury residence located overlooking the village. Saint Martin de Belleville is an authentic village that lives all year round and offers many activities for all ages. Comfortably furnished residence with access to the swimming pool, the Spa (sauna, steam room, jacuzzis) and the fitness center of the Chalets du Gypse. Fantastic view on the village and the mountains from the South West terrace of the apartment. We had an incredible week staying in Ann and Luc’s beautiful apartment. The chalet was spacious and had everything we needed for our party of 6. Added perks were being ski in ski out, the heated boot lockers, and parking. We ordered fresh bread daily, which we could collect from reception. The village was a 5 min walk downhill, where we visited the local restaurants and a little supermarket for all our grocery needs. I also want to add how lovely the ladies at the front desk were! They were so welcoming and accommodating. I couldn’t recommend this apartment enough for a week away with family or friends! Thank you for your appreciation; it makes us happy that you had a great stay in our apartment in St Martin de Belleville. We also love this village full of charm and with good restaurants. As we attach great importance to comfort, services, quality and good follow up, it is indeed important to have some feedback from our tenants. We loved our stay at Chalet des Gypsy over our Canadian March Break in 2019. 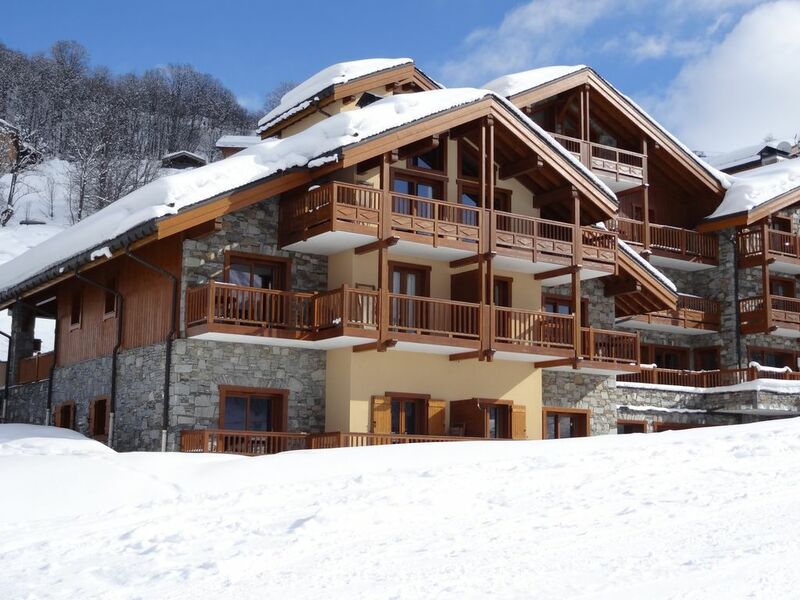 Apartment is right on the slopes that take you directly to the 3 vallee ski area. Luc was great at answering every question and guiding us up to the day of our visit. The ladies at the front desk are sooo lovely. Apartment lacked nothing. Room to sleep 8 people comfortable...even though we were only 5. The pool and saunas are and incredible treat after a day of skiing. The location of the chalet was just what we were looking for. St. Martin is such a quaint French village...people are lovely...the butcher, fromagerie and pastry shop were visited everyday by us....such a TREAT. The store is open from 8-8 every day as well. The restaurants were fantastic as well. All this within a 5 minute walk down stairs into the village. PERFECT stay...to end our dream ski trip to France. This is a high quality apartment in a new chalet with full spa facilities including pool. It is very spacious and well appointed, including the biggest lounge we have seen in many years of hiring ski apartments. The views over Saint Martin are lovely. You can easily ski in/ski out, with just a short glide down to the Saint Martin 1 lift. The owners are helpful and responded promptly during the booking process, and the ladies at reception are delightful, even telephoning us one evening when we had forgotten to order our baguettes for the next morning! They were also very accommodating to my niece who was leaving late on Saturday after we checked out in the morning. The only small disadvantage, if you do not bring a car, is that it is a bit of a walk to the village for shopping/ski hire etc, but this is a small point. Thoroughly recommended and we hope to return. Thank you Anne and Luc - a wonderful stay in your lovely apartment. Everything necessary is provided in the flat, even British TV channels, with quality furnishings and ample equipment for catering. Fresh bread can be ordered each day, reception staff were friendly and helpful, and the spa area was most welcome after a day on the slopes. Easy ski in and out, straight down to the gondola and the small button lift. Great views over the village and easy walk down the steps at the side of the button lift into the village in the evenings. We will definitely be back! Thank you for your appreciation; it makes us happy that you had a great stay in our apartment in St Martin de Belleville. We also love this resort, the village full of charm and with good restaurants. As we attach great importance to comfort, services, quality and good follow up, it is indeed important to have some feedback from our tenants. Thank you. - to contact us as quickly as possible just to be sure to get the desired week! - Indeed, I also prefer to give "priority" to serious people. Again thank you and have a nice year 2019. Had a great week over the New Year. St Martin de Belleville is a very pretty village with plenty of shops and restaurants. The apartment was fantastic both location wise and facilities. Easy ski in ski out. Location is at the top of the village so nice view, there are a few steps ( approx 100yds) down to the village but can easily reach the huit a huit supermarket and surrounding shops and restaurants. The apartment was warm and comfortable with everything you would need. The pool and spa area was fabulous, it had 2 saunas and 2 steam rooms as well as pool and jacuzzi. To say it was school holidays it was rarely busy. Staff on reception very helpful. Underground secure parking. Fresh bread and croissants delivered every morning if required. What more could you want? Would definitely stay there again. Nous avons passé une semaine fantastique dans cet appartement, nous étions 4 adultes et 4 enfants et avons trouvé tous les éléments nécessaires à un bon séjour au ski. appartement très chouette et confortable, départ et retour skis aux pieds, piscine, sauna et hammam un vrai plus, service réception super, le départ de la cabine et des cours de ski est à quelques mètres en traversant une petite piste.... nous avons eu la chance d avoir de la neige à Noël, vraiment le top! Par ailleurs Saint Martin est une petite station très sympa avec de nombreux restos excellents, vraiment parfait, nous reviendrons!!! Merci pour votre appréciation; cela nous fait plaisir que vous ayez passé un excellent séjour dans notre appartement à St Martin de Belleville.Nous adorons également ce village plein de charme et de bons restaurants. Comme nous attachons beaucoup d'importance au confort, aux services, à la qualité et au bon suivi, il est effectivement important d'avoir des retours de nos locataires. Les taxes de séjour locales sont obligatoires et s'élèvent à +/- € 1,65 / pers/jour La caution de € 750,- vous sera demandée sur place.